It has been a delirious few days of genealogical discovery. Pure giddiness. It surprised me when Google came up with 2 hits on his name. I stared at it for a very long time before clicking on the link. But I did…I clicked….and I was stunned. You see, I didn’t know if this guy had died or had ditched his wife and 3 children in Norway. I decided years ago that he abandoned his family and I’ve held him low regard ever since. However, that never stopped my curiosity of finding him; discovering the reason of why he would leave his wife and young children behind. All I knew is that I couldn’t find him in Norway and was mostly unsuccessful in finding him in the U.S. Until this week. My great-great grandfather did leave his wife and kids in Norway. I don’t know if he ever contacted them after that. I doubt it. He came to America in the early 1860s. 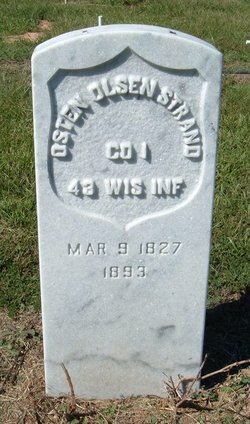 In 1864 he enlisted in the 43rd Infantry Regiment from Wisconsin. He served during the Civil War. He didn’t fight in any major battles but provided guard detail for the railroad in Tennessee. He mustered out in 1865. After that I have no information other than his gravesite in Oklahoma. He died in 1893. In 1893 there was a “land rush” in Oklahoma. Remember your history class? The “sooners” of Oklahoma? That’s when the federal government opened up the land for “first come first serve” land grabbers. Apparently there were 4 or 5 of these land grabs. 1893 was one of the last. A dusty race to find a hunk of land. Some people died of heat stroke, stampedes, greed. I don’t know if he died during the 1893 land grab. It’s possible. I’ll never know why he left his family. Did he come to the U.S. to find a new home for his family? Was he going to send for them once he found a place in the land of opportunity? Was he going to work, save money, and then send for them? Did he simply abandon them? Only the past knows the answers. I will try to find some answers: where did he live between 1865 and 1893? What kind of work did he do? Did he marry someone else? These answers will take time. Finding him gives me comfort. I now know where he went after leaving his family. He served his new country in the war between the states. He settled the frontier. I know where he is buried. That satisfies my curiosity but I’m still disappointed that he left his wife and children behind in Norway.